Product prices and availability are accurate as of 2019-04-20 00:15:38 UTC and are subject to change. Any price and availability information displayed on http://www.amazon.com/ at the time of purchase will apply to the purchase of this product. 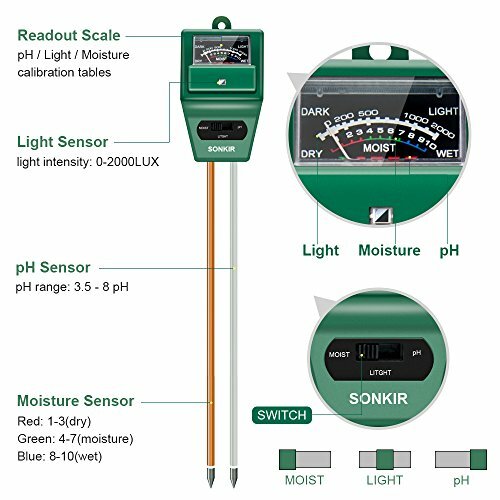 Sonkir MS02 Soil pH Tester Makes You be a Good Plant Carer ! INDUSTRY-LEADING WARRANTY: We promise 12-Month Hassle Free Money Back or Free New Replacement guarantee if you receive the defective products or have any questions before you decide to leave a negative feedback or review ! 3-IN-1 FUNCTION: Test soil moisture, pH value and sunlight level of plant with our soil meter, quickly helps you specialize in grasping when you need to water your plant, control the pH value in the soil and know about whether it gets adequate sunlight. ACCURATE AND RELIABLE: Premium Double-needle Detection Technology strongly enhances the speed and accuracy of detecting and analyzing soil moisture and pH acidity, refuse to be a killer of plants, promote plant growth in a healthy way. EASY TO USE: No batteries needed, just insert the sensor probe into the soil about 2-4 inches, toggle switch to test moisture, pH, sunlight you would like to measure, then wait for a few minutes till the pointer stops swinging to get a stable reading on the scale dial. If the plant is very dry, the soil pointer will not swing, that means your plant needs water. INDOOR & OUTDOOR USE: Design to be lightweight and portable, easy to carry around for outdoor use, ideal soil test tool kit for home plants, garden, lawn and farm.